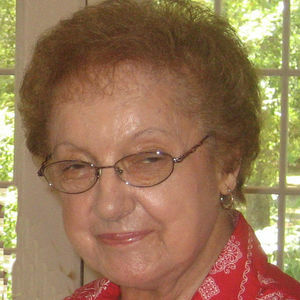 Lena Muscarello Allulli, age 94 of Hammond, Louisiana, passed away on Saturday, March 9, 2019 at her home. She was born on September 11, 1924 in Hammond, Louisiana, the daughter of the late Peter and Carolina Muscarello. She attended St Thomas Aquinas Catholic School, later known as Holy Ghost Catholic School, and was a graduate of Hammond High School. She was a long-time parishioner of Holy Ghost Catholic Church. She met her husband-to-be, Paul Allulli, of New York City, NY at a dance on the President riverboat during World War II, while he was serving in the Navy. He was enchanted and returned to marry her on June 23, 1946 when the war was over. He preceded her in death on May 31, 1991. She was known for her sweetness, her humor, and the joy she took in feeding her family and any friends they might want to bring to her table. No one could make meatballs or lasagna like hers, no matter how hard we all tried! She made our plates for Sunday dinner into her nineties and enjoyed family holiday gatherings full of laughter her entire life. She was preceded in death by her parents, her brothers Santo Muscarello and Frank Muscarello, her sisters Rose Drago, Agnes Desalvo, Mary Costanza, Frances Ciolino, Sarah Alfonso, Laura Ciolino, and Annie Silvia. She is survived by her children Bernard Allulli (Genevieve), Linda Allulli Wells, Anthony Allulli (Gail), and Paula Allulli DePaula (Brian); grandchildren, Eric Wells (Amber), Amy Wells Mount, Nicole Allulli Brown (Douglas), Beau Allulli (Rachel), Michelle Allulli Dionne (David), Chris Allulli (Peyote), A.J. Allulli (Lauren), Regina Allulli, Becky DePaula Guidry (Jai), and Tim DePaula (Julianna); great-grandchildren Regan Wells, Ethan Wells, Sierra Bailey, Coyt Dillon Bailey, Cameron Dionne, Alexis Dionne, Xavier Allulli, Jude Allulli, Talon Guidry, Tucker Guidry, Lena DePaula, and Lucia DePaula; as well as numerous nieces, nephews and cousins. Family and friends will be welcomed at Harry McKneely & Son Funeral Home, 2000 N. Morrison Blvd.Hammond, Louisiana 70401, on Monday, March 11, 2019 from 6-9 pm, with a service at 7pm, with Fr. Robert Merced officiating. Burial will be Tuesday, March 12, 2019 at Rose Memorial Gardens in Hammond, Louisiana at 9 am. A Celebration of Life will be held on Saturday, March 23, 2019 from 1-4 pm at the home of her son Bernard Allulli, all family and friends are invited to attend. So very sorry to learn of Ms. Lena's passing. I truly admired her so. Her kindness was always so freely given. What a blessing she was to her loved ones. My sincere condolences to all of you. You will be in my thought and prayers. So very sorry to learn of Ms. Lena's passing. I truly admired her , her kindness was always given so freely. My sincere condolences to all of her family. What a blessing she was to her loved ones. My thoughts and prayers are with you all. My memories of Aunt Lena are of filled with sweet times of her kindness, warmth, and love. I never left her home hungry. She enjoyed feeding company her delicious home cooking. Aunt Lena was always sincere and caring. Peace and love from my family, whose lives she touched, to her family, Bernard, Paula, Linda, Anthony, and all of her grandchildren and great-grandchildren. Betty and I are sorry for your loss. We pray that Our Lord and Saviour will grant your mom a heavenly rest and that she will be reunited with all her loved ones who have gone before her our heavenly Father. Mrs. Lena always had a beautiful smile and a sweet and gentle way about her. We extend our deepest sympathy to her sons, daughters and their families. No matter how prepared you think you are, you are never really ready to lose a parent. My thoughts and prayers go out to all of my Allulli friends. So sorry for your loss. She is one beautiful and giving angel!! All my love!! I will remember her in my prayers as well as pray that peace comes to each of you. Condolences to the family. Mothers are the most expensive beings on earth. No one and nothing can fill the void we feel when they pass away. May our Lord comfort and give you peace to get you thru the days ahead.